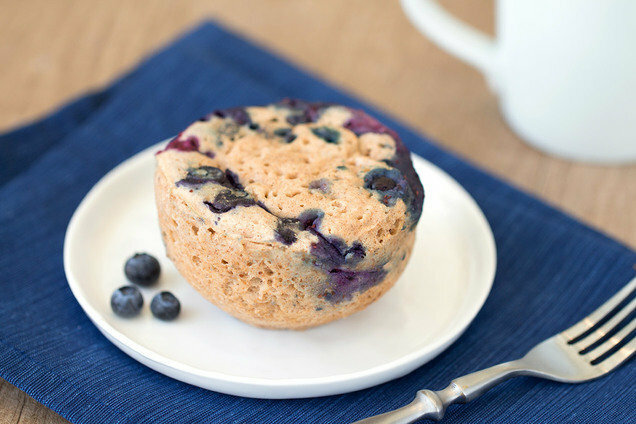 You want a muffin, but the ones you buy are likely to be huge and loaded with too many calories. And you don't want to bake a whole batch, because chances are, you'll eat more than one. Solution: this made-in-the-microwave recipe! Spray a large microwave-safe mug with nonstick spray. Add both types of flour, sweetener, baking powder, cinnamon, and salt. Mix well. Add all remaining ingredients except blueberries. Stir until uniform. Microwave for 2 1/2 minutes, or until set. Immediately run a knife along the edges to help separate the cake from the mug. Gently shake mug to release muffin, and plate, right side up. HG FYI: If using frozen blueberries, check the ingredient list to make sure no sugar has been added; the only ingredient should be the fruit itself. Hungry for More Single-Serving Sweets?